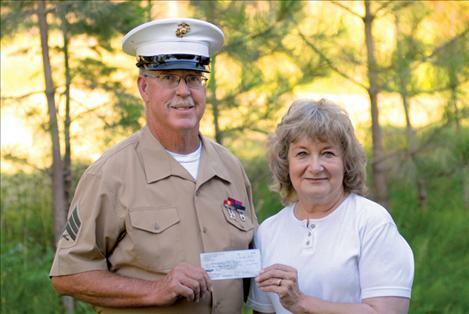 Chuck Lewis, representing Standing for the Fallen, donates funds collected at the Polson Flathead Cherry Festival to Magazines for Troops’ Esther Gunlock. POLSON — When Standing for the Fallen and Magazines for Troops were both spreading the word about their causes at the Polson Flathead Cherry Festival, Standing for the Fallen’s USMC Sgt. Chuck Lewis decided to split the donations he gathered with Magazines for Troops. The funds will be used to pay for postage to send 16 boxes of magazines, DVDs and paperback books to troops serving overseas. Standing for the Fallen collects donations to benefit, in a variety of ways, wounded warriors and active military. Magazines for Troops does just what the title implies: sends magazines, paperback books and DVDs to active military overseas. Drop-off points for Magazines for Troops are located in Polson at Super 1 Foods, Insty Prints, Walmart and Valley Bank inside Safeway. In Ronan, paperbacks, DVDs and magazines may be dropped off at Mission Mart, Harvest Foods, Lucky Strike Lanes and Valley Bank. Additionally, coin jars for postage are located throughout the valley at local businesses. “Every penny goes to postage,” Gunlock said. “For $11.35, you can adopt a box that is sent every month.” Gunlock added that they need $1,600-1,800 for postage every month.